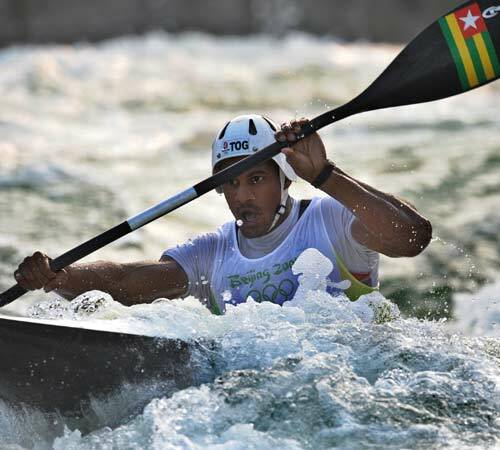 Like a spring, Benjamin Boukpeti burst on to the Olympic stage, winning Togo's very first Olympic medal. Without the Olympics, Boukpeti might still remain nobody. The 27-year-old snatched a bronze in men's K1 slalom with a result of 173.45 seconds, combining semifinal and final on Tuesdday. "I don't really know yet what this represents, I just tried my best and paddled very hard,"added he, whose main goal was to reach the final and played his best in the last four years. Boukpeti's father is a Togolese while his mother a French. "I was born in France with my brother while my two sisters born in Togo. My father and mother used to teach in Togo,"said he, who lives in Toulouse of France. On why he chose to represent Togo rather than France, Boukpeti said: "I started young for the French team selection. This is a very hard selection process. I suffered injuries and once I recovered I was too old for the French team. Because of this I decided to try for the Togo team." Beijing Games was not his Olympic debut, four years ago in Athens, Greece, Boukpeti finished with a 18th place, failing to advance to the final. The result was then the best for Togo in Olympics. "In Africa it's all about soccer but in France they have a lot more money to build training courses and facilities. I have two worlds." That's why Boukpeti has been training in France, together with Fabien Lefevre, silver medalist of the event. "Deep down, I tried really hard. A long time ago I beat him in competition, so I thought now would have been a good time to do it again. I would have loved to have beaten him again,"said Boukpeti. Though a Togolese, Boukpeti has been to Togo only once when he was very young. "But now I have a very good reason to go back." - Thank you, my mentor!